Republican Rep. Richard Hudson (N.C.) on Tuesday introduced a bill that would require states to recognize each other's gun carry permits. The Concealed Carry Reciprocity Act of 2017 would address the patchwork nature of the country's gun carry laws. 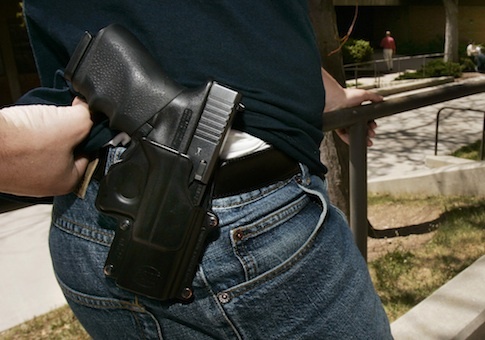 Currently, each state decides which other states' gun carry permits it will recognize. Some states recognize all other states' permits, other states recognize no other states' permits, and many fall somewhere in between. Gun rights advocates have long decried the web of local laws as confusing and unfair–one in which a wrong turn or missed exit could end in an otherwise law abiding gun owner unintentionally committing a felony. "Our Second Amendment right doesn't disappear when we cross state lines, and this legislation guarantees that," Hudson said in a statement. "The Concealed Carry Reciprocity Act of 2017 is a common sense solution to a problem too many Americans face. It will provide law-abiding citizens the right to conceal carry and travel freely between states without worrying about conflicting state codes or onerous civil suits." Sources within the major gun rights organizations have consistently said that a national reciprocity law is among their top priorities, along with a pro-gun Supreme Court pick and reform, for the upcoming congress. Now, after announcing the bill had been drawn up before the new year, Hudson has introduced his take on the proposal. Hudson's bill would require states to recognize the validity of every other state's gun carry licenses, but it would require concealed carriers to follow the specific laws of whatever state in which they are carrying. The bill mostly mirrors national reciprocity bills introduced by Hudson in previous years but adds language designed to ensure that those in Constitutional Carry states, where no permit is required to concealed carry, are protected by the legislation. The bill would also allow concealed carry in the National Park System, the National Wildlife Refuge System, and on lands under the authority of the Bureau of Land Management, Army Corps of Engineers, and Bureau of Reclamation. Gun control groups oppose the plan. In an email to supporters last week, Everytown for Gun Safety described the idea of national reciprocity as "a dangerous policy that would force all 50 states to let dangerous people carry hidden, loaded guns in public–even people with violent criminal records, stalkers, and domestic abusers." Hudson said he is hoping to work with other House members and Trump administration officials on passing the legislation. "As a member of President-elect Trump's Second Amendment Coalition, I look forward to working with my colleagues and the administration to get this legislation across the finish line," he said in his statement. The bill comes on the heels of several Republican congressmen forming the Second Amendment Caucus with the purpose of forwarding gun rights legislation at a time when gun rights activists are optimistic about their chances in the new Congress. This entry was posted in Issues and tagged 2nd Amendment, Concealed Carry, Gun Control, Guns. Bookmark the permalink.